1. 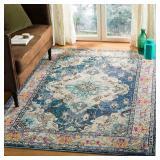 Safavieh Monaco Vintage Boho Medallion Navy / Light Blue Rug. Size:9' X 12'. Pile height is 0.25 - 0.5 inch. Made of enhanced polypropylene fibers. This item is NEW!! In retail packaging. Please preview to insure complete satisfaction. 2. Safavieh California Cozy Plush Ivory Shag Rug. Size: Square, 8'6" x 8'6". Plush, luxurious shag style, Extra thick high pile height of 2 inches, Neutral creamy ivory color, Sturdy polypropylene backing, Virtually non-shedding polypropylene fibers. 3. 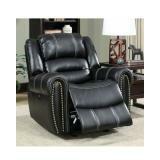 Aren Leather Manual Motion Recliner. Upholstery Material: Faux leather Reclining Type: Manual. Overall 40'' H x 37'' W x 40'' D.
4. 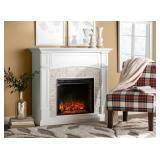 Cameron Electric Fireplace. Crafted of manufactured wood and veneers, it offers a paneled frame while faux white stone highlights the flickering flames in the center. Heating Coverage Area: 400 square feet, Maximum BTU Output: 4700 BTU. Overall 40.75'' H x 45.75'' W x 14.5'' D.
5. Hillview Upholstered Bench. Upholstery: Slate Blue. Weight Capacity: 550 lb. 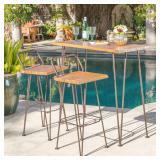 Material Details: Manufactured wood; metal; polyester. Upholstery Material: Velvet. Overall 20'' H x 63'' W x 22'' D.
6. 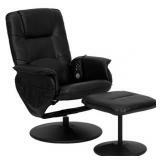 Leather Heated Massage Chair with Ottoman. Massage chair pressure points are the lumbar, thighs and legs, Upholstery Material: LeatherSoft, Massage Types: Vibration, Weight Capacity: 250 lb. Overall 39'' H x 29.5'' W.
7. Chase 4-Light Bath Bar. Finish: Polished Nickel. Fixture Material: Metal, Maximum Wattage (per Bulb): 60 Watt, Dry, Damp or Wet Location Listed: Damp, Power Source: Hardwired. Overall 25'' H x 5.25'' W x 3.75'' D.
8. 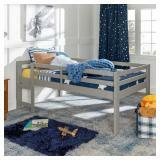 Sandi Junior Loft Bed. Size: Twin. Color: Gray. Crafted of solid pine wood, this bed strikes a classic silhouette with a horizontal planked headboard, footboard, and guard rail. Overall 46.5'' H x 44.25'' W x 80'' L.
9. 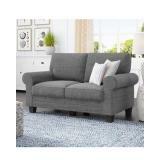 Buxton 61" Rolled Arm Loveseat. Upholstery: Gray. Its frame is crafted from metal while the seat and back sport polyester blend upholstery awash in a solid color. Overall 35'' H x 61'' W x 32.5'' D.
11. Maidenhead Entertainment Center for TVs up to 50". 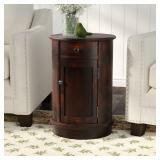 TV Stand features a warm, distressed-look wood base and antiqued black metal chains. Overall 31'' H x 48'' W x 18'' D.
12. 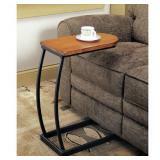 Monica End Table With Storage. Color: Cherry. Showcasing a round oak frame, it features a cabinet ideal stocked with essentials while the single drawer up top makes a lovely home for stamps and stationary. (No item has the same grain color, finish, or wood knots due to natural factors.) Overall 26'' H x 17.75'' W x 17.75'' D.
14. 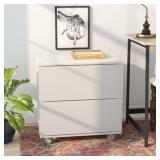 Duave 2 Drawer Lateral Filing Cabinet. Color: White. Material: Manufactured Wood. Overall 23.81'' H x 23.62'' W x 15.75'' D.
15. 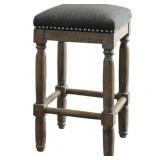 Bonnes Bar Stool. 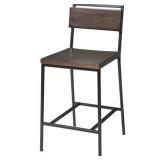 Constructed of solid wood and carbon steel for strength and stability, this stool is paired with a hand-applied, 10-step Black Cherry wood finish and Black Matte frame to create a warm and inviting seating option. Weight Capacity: 225 lb. Overall 42.25'' H x 16.5'' W x 21'' D.
16. 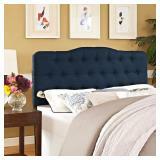 Annabel Queen Upholstered Fabric Headboard. Color: Navy. 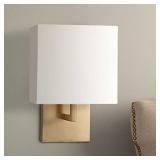 Dimensions: 4"L x 62"W x 48.5 - 56"H. Annabel is made from fiberboard, plywood, and fine polyester upholstery for a construction that is both lightweight and long-lasting. 18. Naples Headboard. Size: King. Color: White. Made of engineered wood. Overall 81'' W x 3'' D.
21. 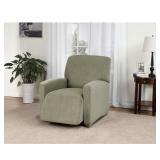 Wellersburga Manual Recliner. Upholstery: Teal. Upholstery Material: Polyester Blend. Weight Capacity: 250 lb. Overall 40'' H x 31'' W x 30'' D.
23. Regina Andrew Home Bone Drum Table . Finish: Antique Brass. Material: Brass. Dimensions: 25.25H x 14W x 14D. 24. 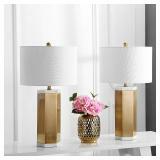 ( Set of 2 ) Alya White and Brass Gold Table Lamp. Crafted of marble and metal with a cotton shade. Dimensions: 15 x 15 x 28 inches. 26. 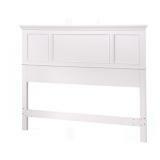 Eichhorn Platform Bed. 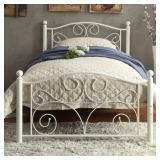 Made of metal, it includes a headboard, footboard, side rails, and slats to support your mattress without a box spring. Its non-toxic white finish. Overall 35'' H x 42'' W x 79'' L.
27. 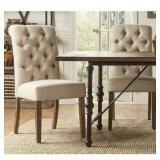 ( Set of 2 )Pompon Upholstered Dining Chair. Upholstery Type / Color: Linen - Beige. Crafted from a rubberwood frame and foam filling wrapped in solid-hued upholstery, this chair showcases a high back for a classic silhouette. Weight Capacity: 260 lb. Overall 39.5'' H x 18.25'' W x 28'' D.
28. Regina Andrew Home Bone Drum Table . Finish: Antique Brass. Material: Brass. Dimensions: 25.25H x 14W x 14D. 29. Proctor 1-Light Bowl Pendant. Finish: Satin Nickel. Crafted from metal, this fixture is suspended by a metal rod awash in a neutral hue, blending effortlessly with your color scheme. Fixture 14'' H x 13'' W x 13'' D.
30. 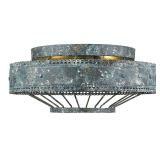 Ferris 2-Light Blue Verde Patina Flushmount. The unique metal work features a scallop detail and a multi-layered, hand-painted finish. The blue verdigris patina finish is applied with white and gold accent to create a chic, but weathered look. 31. Creative Co-Op Large Oval Grey Wood Wall Clock. Heavily distressed grey finish, Requires 1 AA battery (not included), 24.25"L x 2.5"W x 29.5"H .
32. Rockmill Adjustable Height Swivel Bar Stool. Color: Black/Red. 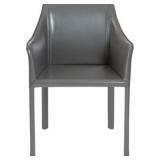 Seat Material: Faux leather, Frame Material: Metal, Weight Capacity: 250 lb. 33. 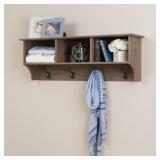 Douglas 48" Hanging Entryway Shelf. Color: Gray. Dimensions (Overall): 16.5 inches (H) x 48 inches (W) x 11.5 inches (D). Care & Cleaning: Spot or wipe clean, Holds up to: 50.0 pounds, Material: Particle Board, Wood Composite (Frame). 34. Astra Ottoman. Upholstery: Antique Sage. 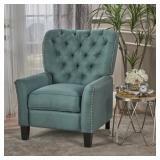 Crafted from faux leather with a foam and polyester fill, this glamorous design showcases nailhead trim accents for an extra-stylish touch. Measuring 19.9'' H x 18.3'' W x 18.3'' D.
35. Willards Genuine Leather Upholstered Dining Chair. Defined by its minimalist design and streamlined silhouette, this dining chair brings a dash of modern style as it offers a spot to sit. Crafted from steel, this piece’s frame features four straight legs and a solid powder-coated finish to set an understated foundation. Up above, the square seat, tall back, and angular arms are wrapped in anthracite-hued regenerated leather upholstery that blends easily with a variety of color palettes. After assembly, this chair supports up to 250 lbs. 37. 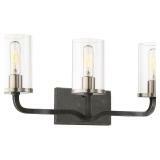 Cliffside 4-Light Semi Flush Mount. Crafted of metal, this fixture features angular arms that prop up four 60 W candelabra-base incandescent bulbs (not included) as they cast light in an ambient direction. 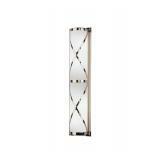 Fixture 7.5'' H x 20'' W x 20'' D.
38. 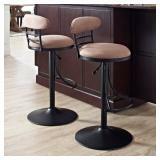 (Set of 2) Remy 26" Bar Stool. Upholstery: Gray. Crafted from a mix of manufactured wood and birch hardwood, this low-key backless Remy 26" Bar Stool offers a touch of rustic style as it lends a seat. Overall 26'' H x 14'' W x 14'' D.
39. Rhinecliff 3-Light Chandelier. Finish: Oil Rubbed Bronze/Antique Silver Leaf. 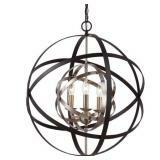 Fixture Design: Globen, Primary Material: Metal. Fixture 23'' H x 22'' W x 22'' D.
40. 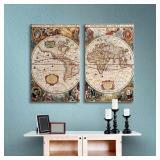 World Map 2 Piece Graphic Art on Wrapped Canvas Set. Portraits of Julius Caesar, Claudius Ptolemy, Jodocus Hondius, and Gerard Mercator sit in each corner for even more eye-catching appeal, while earthy green, brown, red, and yellow hues offer a splash of color. Overall 24'' H x 36'' W x 2'' D.
41. ( Set of 2 ) Mohnton Solid Back Side Chair. White. Ergonomically shaped for comfort, Main Material: Plastic, Main Material Details: Polycarbonate. Overall 33'' H x 18.5'' W x 21.1'' D.
42. (Set of 2) Mohnton Solid Back Side Chair. 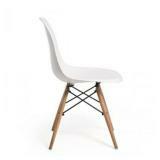 Color: White seat/Natural wood legs. Ergonomically shaped for comfort, Main Material: Plastic, Main Material Details: Polycarbonate. Overall 33'' H x 18.5'' W x 21.1'' D.
43. Armande Candle-Style Chandelier. Size: Medium. Number of Lights: 6, Primary Material: Metal, Fixture 33.25'' H x 25.5'' W x 25.5'' D.
47. VIGO Pull-Out Spray Kitchen Faucet, Matte Black. Premium matte black finish resists corrosion and tarnishing, Features smart handle lever design to allow for tighter space installation, 360 degrees swivel spout 1.8 gpm flow rate, Single-hole installation, Single lever water and temperature control. 48. Georges Armchair. Color: Sienna. Brass metallic legs, Featuring bold, velvet upholstery. Overall 40.94'' H x 33.46'' W x 31.69'' D.
49. (Set of 2). Room Darkening Venetian Blinds. Size: 29.5" x 60" Material: Faux wood, Pieces Included: 1 Blind, 1 valence, 1 tilt wand and 1 mounting hardware, Cord Type: Cordless. 51. Benedetto 5-Light Chandelier. It showcases a tapered two-tiered design crafted from rows of long beveled crystals. The chandelier is crafted from metal with a polished brass finish. Fixture 15'' H x 14'' W x 14'' D.
54. 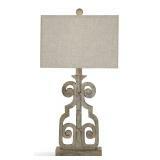 Justine 24" Table Lamp. Featuring a dark bronze-finished metallic base and copper gold-hued bell shade, this design blends in perfectly with earthy palettes in any space. Base Material: Resin, Polyresin construction, Overall 24'' H x 14'' W x 14'' D.
55. 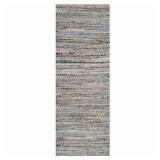 Gaines Power Loomed Natural Area Rug. Size: Runner 2' x 6'. Technique: Power Loom, Construction: Handmade, Material: Jute. 56. Montross Blue Area Rug. Size: 2'8" x 7'11" Technique: Machine woven Construction: Machine Made, Material: Polyester. 57. 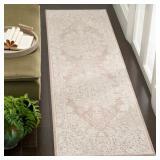 Safavieh Natural Fiber Arbor Border Area Rug. Size: 3' X 5' 100% Seagrass, Power Loomed in China, Pile Height: 0.25 in. 58. 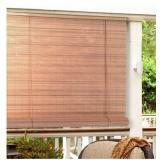 Lewis Hyman Woodgrain PVC Patio Roll Up Blinds. Size 36" Wide x 72" Long. Automatic Cord Lock Which Allows Height Adjustment, Installation Hardware For Hanging, & E-Z-Trac Adjustable Head Rail, Installs As Inside Or Outside Mount, For Use Indoors Or Outdoors, Perfect For Patios, Porches & Sun Rooms, Light Filtering, Semi-Private. 59. 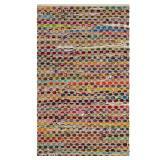 Safavieh Cape Cod Coastal Hand-Woven Natural/ Multi Jute Area Rug. Size: 3' X 5'. Material: Jute,Weave Type: Hand-woven,Shape: Rectangle. 60. Superior Bohemian Trellis Collection. 8mm Pile and Jute Backing, Moisture Resistant and Anti-Static Indoor Area Rug. Material: Polypropylene. 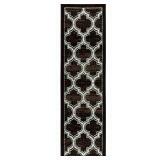 Rug Size: Runner 2'7" x 8'. 61. Custodio 3-Light Vanity Light. Crafted from stainless steel, this fixture features a rectangular backplate and a curvy silhouette with bent arms in a versatile iron black finish. Overall 10.38'' H x 24'' W x 24'' D.
62. Semi-Sheer Turtle Brown Roman Shade. 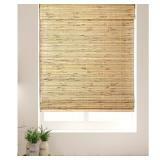 Product Type: Roman shade, Material: Bamboo, Cord Type: Cordless. 27" W x 74" L Blind Size. 63. 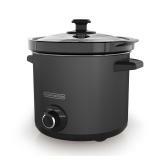 BLACK+DECKER 4-Quart Slow Cooker with Chalkboard Surface, Slate. Three Heat Settings: Low, high, and warm settings for all your slow-cooking needs. Stoneware Pot: The durable 4-quart pot retains heat and is easy to clean. Tempered Glass Lid: Keep an eye on your food while it cooks without lifting the lid. 64. Lavish Home Plush Croc Embossed Faux Fur Mink Throw Cream. Material: 100% Polyester, Face material: PV fur, Backing material: Mink. Overall 50'' W x 60'' L.
65. 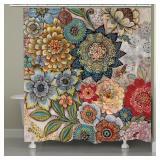 Boho Bouquet Shower Curtain. Material: Polyester, Number of Hook Holes: 12. Overall 72'' H x 71'' W.
66. 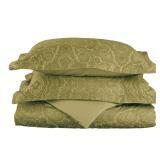 600 Thread Count Wrinkle-Resistant Italian Paisley Duvet Cover Set. Size: King. Color: Green. Duvet cover (92" x 106"). 67. 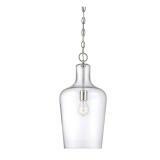 Franklin 1 Light Pendant Polished Nickel. Dimensions 10 inches in diameter x 20 inches high. Finish: Nickel Finish, Polished. Material Glass, Meta. 68. Kathy Ireland Day Break Large Recliner Slipcover. Color: Green. Dimensions: Fits large recliners measuring up to 88. Form fitting designs, Comes in 4 pieces, Made with polyester/ spandex blend. 69. 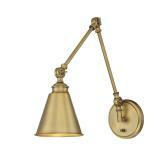 Strick & Bolton Bley 1-light Warm Brass Metal Adjustable Sconce. Dimensions 6 inches x 16 inches. Material: Metal. 70. Lush Decor Riley Window Curtain Panel. Color: Gray. Dimensions: 84 inches long x 54 inches wide. Materials: 100-percent polyester. Care instructions: Dry clean only. 71. Safavieh Reflection Contemporary Oriental Beige / Cream Polyester Rug. Size:2'-3" X 10'. Material: Polyester. Color: Brown, Ivory. 72. 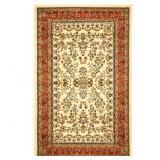 Safavieh Lyndhurst Traditional Oriental Ivory/ Rust Rug Size: 3'-3" X 5'-3". Primarily crafted of Polypropylene, Pile height is 0.375 inches. 73. Doughty End Table. Constructed of metal in a matte black finish, this table features a sled-style C-shaped frame with curved posts and a U-shaped base with six small feet. Overall 24'' H x 18'' W x 10'' D.
74. 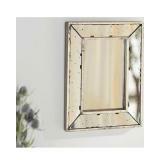 Kapp Rectangle Accent Wall Mirror. Non-beveled glass panels completely cover the rectangular design so you can catch a glimpse of your reflection, while its angled sides help scatter light in several directions to give your room an open feel. Brush nickel silver-finished. Overall 24'' H x 16'' W x 1.6'' D.
76. Ultra Soft 100% Cotton 6-Piece Towel Set. Color: Tangerine. 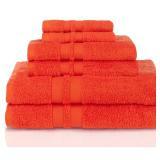 Towel set includes 2 face towels, 2 hand towels and 2 bath towels. Material: Terry cloth. 77. 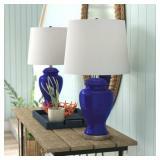 Staytonville 24" Table Lamp. Base Color: Blue. Base Material: Ceramic, Maximum Wattage (per Bulb): 150 Watt, Switch Type: 3-Way. Overall 24'' H x 13'' W x 13'' D.
78. 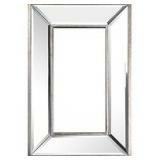 Auvillar Accent Mirror. Its gleaming glass center is the star, but its reflective frame adds eye-catching contrast with intentional distressing for an antiqued appearance. Measuring on the small side at just 11.61'' H x 9.06'' W x 0.98'' D.
79. Strick & Bolton Bley 1-light Warm Brass Metal Adjustable Sconce. Dimensions 6 inches x 16 inches. Material: Metal. 80. 1 Light Pendant. 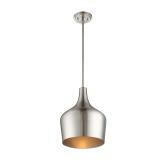 It has a solid metal shade and is finished in Brushed Nickel. Fixture: 47.5'' H x 10.5'' W x 10.5'' D.
81. 1 Light Pendant in Natural Brass. 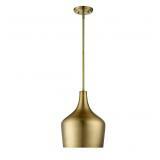 It has a solid metal shade and is finished in Natural Brass. Fixture: 47.5'' H x 10.5'' W x 10.5'' D.
82. 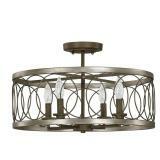 Birchfield 3-Light Flush Mount. Finish: Oil Rubbed Bronze. 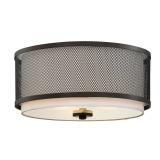 Drum-shaped fixture pairs a metal mesh outer cage with a white fabric interior shade to create a layered look. A trio of compatible 60 W medium-base bulbs (not included) sits within to cast light in an ambient direction. 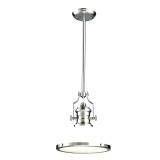 Fixture 6.25'' H x 15'' W x 15'' D.
83. 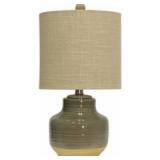 Maisons 30" Table Lamp. Base Material: Resin, Maximum Wattage (per Bulb): 60 Watt, Switch Type: On/Off Switch. Overall 30'' H x 15'' W x 9'' D.
84. Cuisinart CB-60 Stainless Steel Cast-Iron Double Burner. 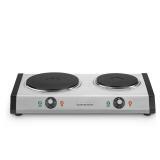 Powerful 1800 watts of power for quick heat-up and heat retention throughout cooking cycle - primary burner: 1300 watts + Secondary burner: 500 watts Two separate 6-setting adjustable temperature controls. 85. Safavieh Cape Cod Handmade Natural / Blue Jute Natural Fiber Rug. Size: 2'-3" X 8'. Primarily crafted of Jute. Pile height is 0.5 inches. 86. 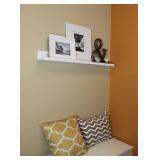 InPlace Shelving Floating Wall Shelf with Picture Ledge. Color: White. Size: 35.4-Inch Wide by 4.5-Inch Deep by 3.5-Inch High. Heavy duty wall mount metal garage storage racks great for storage organization, tools and bins. 87. 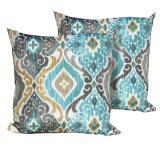 ( Set of 2 ) Persian Mistr Pillow. Polyester fill, Made of imported materials. Size: 18 x 18. 88. Villeneuve 19.5" Table Lamp. Color: Blue. Base Material: Ceramic. Switch Type: On/Off Switch. Overall 19.5'' H x 7.4'' W x 7.4'' D.
89. George Kovacs One Light Wall Scone. Height: 11.50 inches Width: 7.00 inches. 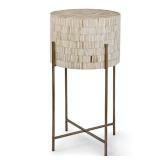 White Linen fabric shade with finish in Brushed Nickel, Chrome, Honey Gold. 90. Festive Damask XL Sofa Furniture Protector. Tones of rust, brown, taupe, and white. Fabric: 100% Polyester, Slipcover dimensions: 0.25 inches high x 120 inches wide x 75.5 inches deep. 91. 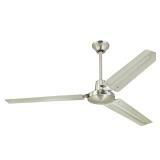 Westinghouse Industrial 56-Inch Three-Blade Indoor Ceiling Fan. Brushed Nickel with Brushed Nickel Steel Blades. Create a comfortable environment with a 172-by-12-millimeter cold-rolled steel motor with single capacitor. Efficient air circulation with Airflow: 7,105 cfm; Energy Usage: 63 watts without light kit; Airflow Efficiency: 113 cfm per watt. 93. 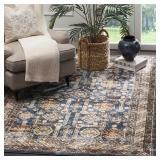 Safavieh Bijar Traditional Oriental Royal Blue/ Ivory Distressed Rug. Size: 8' X 10'. Pile height is 0.25 - 0.5 inch. Crafted of Polypropylene. 95. Superior Bohemian Trellis Collection. 8mm Pile and Jute Backing, Moisture Resistant and Anti-Static Indoor Area Rug. Material: Polypropylene. Rug Size: Runner 2'7" x 8'.